Large, raised wringer to accommodate larger mops. 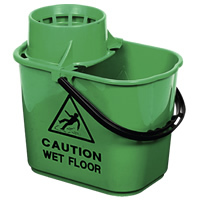 With wet floor warning sign printed on both sides of the bucket. This professional standard mop bucket with built in wringer is large enough to accommodate bigger mops for bigger jobs, so you only need one bucket for any sized floor. The wet floor warning sign printed on both sides ensures compliance with Health and Safety regulations. Multiple colours allow for colour coded cleaning ensuring cross contamination is not possible.The industry standard is red for sanitary appliances and washroom floors, blue for general lower risk areas (excluding food areas), green for general food and bar use and yellow for washbasins and other washroom surfaces. Wet floor caution sign printed on both sides. Raised wringer means overspill goes back in bucket not on the floor !